Since 2008, Marcellus Shale natural gas drilling in Bradford County has increased by 20 percent and Bradford County has hundreds of natural gas wells drilled. The area has attracted national and international investment. Gaining knowledge and an understanding about this growing industry in our area is important. Bradford County is presenting the information throughout these Web pages to help residents and visitors understand the development of the industry and how it may affect our county and state for years to come. The Bradford County Commissioners appointed the Natural Gas Advisory Committee on July 10, 2008 to provide the commissioners and related agencies with necessary information and feedback in regards to the development of the Marcellus Shale in our communities. The committee meets on a quarterly basis and the sub-committees’ meetings are held monthly. Please check the calendar for upcoming meetings. The drilling process begins with pad site construction, which typically lasts approximately one to four weeks depending on the location. Next, the set up of the rig and the drilling of the well will take approximately three to four weeks per well. During this time, operations run continuously 24 hours a day, seven days a week. Multiple wells are sometimes drilled from a single padsite. Although the rig is the most visible part of drilling operations, it is temporary and will be removed once drilling is completed. Once the layer of rock that holds the natural gas (pay zone) is reached, the well will be completed and prepped for production. As with any construction site, there will be additional truck traffic for the setting up and taking down of the equipment. There can be noise, dust and traffic. After the wells are completed, the company regularly returns to monitor and maintain the site. At some well sites, trucks may return to remove water produced by the gas well, which is separated from natural gas during the gathering process and stored in tanks located on the site. A typical drilling pad site is three to five acres in size. The information contained in this web site is provided to you “AS IS.” It does not constitute legal advice, and we are not acting as your attorney. We make no claims, promises or guarantees about the accuracy, completeness, or adequacy of the information contained in or linked to this web site and its associated sites. The Marcellus Shale is a black, low density, organic-rich shale that lies beneath much of Pennsylvania, Ohio, West Virginia and New York. It is projected that nearly 500 trillion cubic feet of natural gas could be produced from the Marcellus Shale. 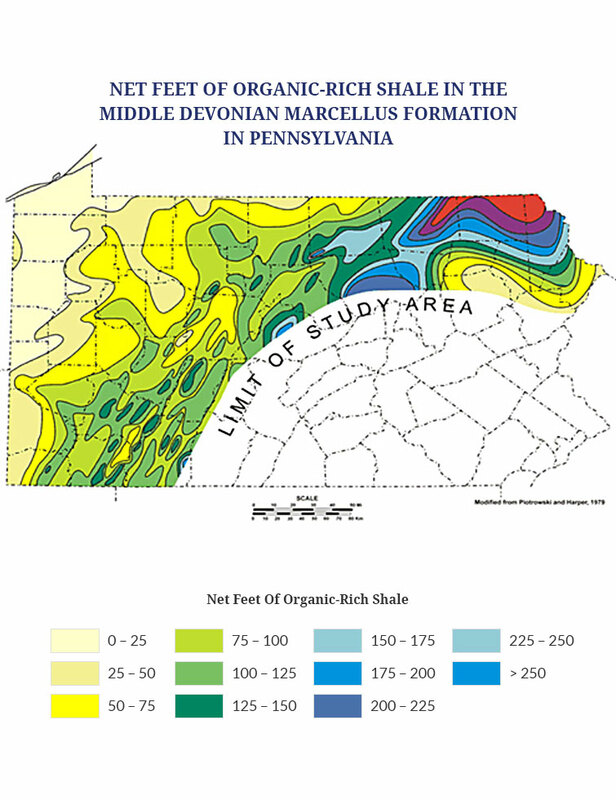 The Marcellus Shale was not widely considered to be an important gas resource until technology for tapping it had been proven in other natural gas shale plays. Many national and international companies are actively drilling or leasing Marcellus Shale properties in Bradford County. Hundreds of thousands of acres above the Marcellus Shale have been leased across the commonwealth with the intent of drilling wells. Infrastructure needed for the drilling and production of natural gas pipelines are being proposed and built to transport the millions of cubic feet of natural gas per day to major markets. In addition to major pipelines thousands of miles of natural gas gathering pipeline systems must be built to connect individual wells to the major pipelines. The drilling of natural gas wells into the Marcellus Shale is a highly technical process. Capturing the gas that is locked away in the shale requires drilling companies to use processes such as horizontal drilling and hydraulic fracturing.